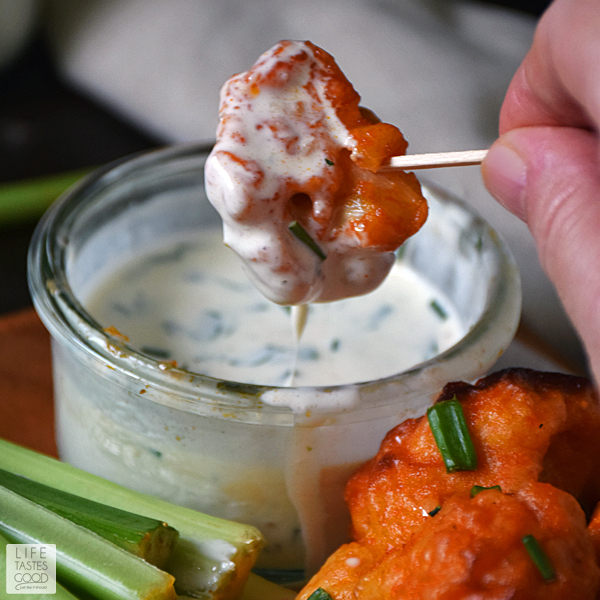 Baked Buffalo Cauliflower Bites with a dairy-free ranch dipping sauce are loaded with all the flavors of one of our favorite Monday Night Football appetizers, but in a better-for-you option. 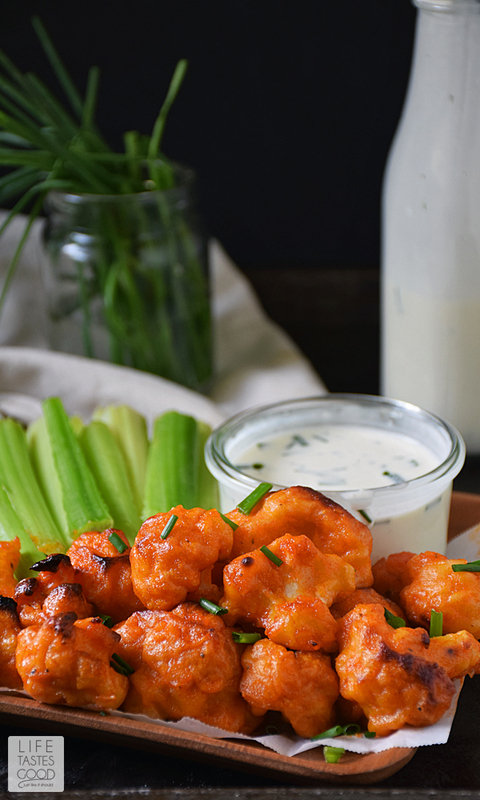 These spicy buffalo cauliflower bites are meatless and dairy free too! So what do you think my husband thought when I served these up for our game night feast?! Can I get away with Buffalo Cauliflower Wings? When Monday night rolled around, I had these spicy buffalo cauliflower bites, aka cauliflower wings, ready and waiting for him when he walked in the door from work. As usual, Don is a good sport and will try anything I make, so he dug right in! I was in the other room when I heard, "WOW! If I didn't know better I'd think these were chicken wings!" SCORE!! 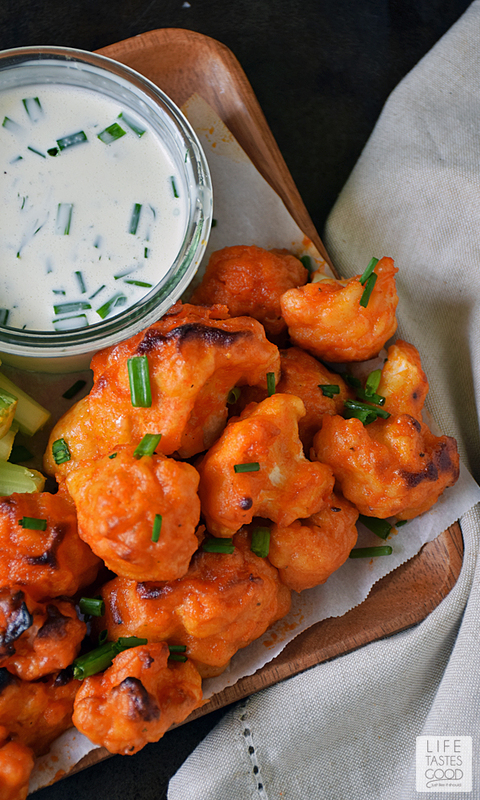 Buffalo Cauliflower Bites for the WIN! Don gobbled them right up and asked for more! Meatless Monday Night mission accomplished! He also loved the homemade ranch dip I made for dipping the buffalo cauliflower bites. Shhhhh I didn't tell him that it is dairy free. I figured I better not push my luck. 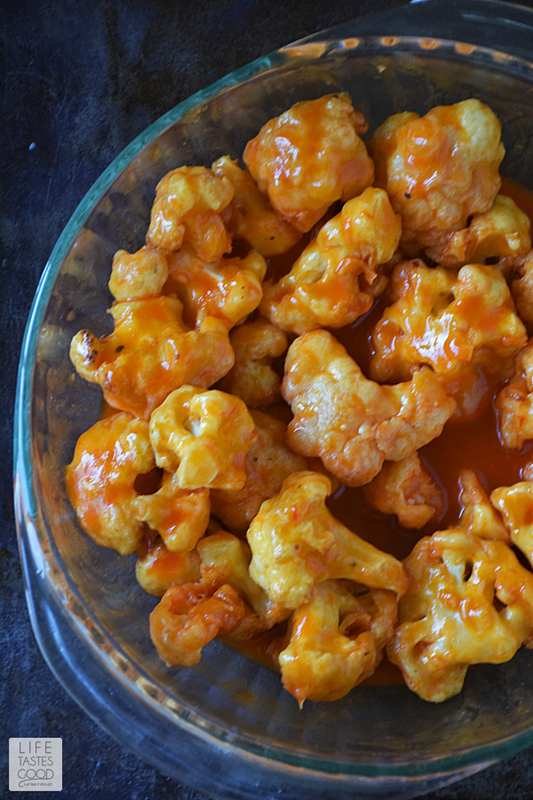 Now, I need to run out and get more cauliflower, because these Baked Buffalo Cauliflower Bites are going to be making a regular appearance on game days! Start this recipe by making the dairy-free ranch dip, that way it can chill in the refrigerator while the buffalo cauliflower bites are being prepared. The dip is very easy to make and can be mixed by hand. I recommend using fresh herbs for maximum flavor. Whisk ranch dipping sauce ingredients to combine. Give it a taste and adjust the seasonings to your liking. Cover and refrigerate until ready to use. and whisk until smooth and thickened. Bake in the preheated oven for 20 minutes or until the cauliflower bites start to brown. While the cauliflower bites are baking, melt 3 tablespoons dairy-free butter and mix with 1 (5 ounce) bottle of cayenne pepper sauce and 1 tablespoon honey. Whisk to combine. Give it a taste and adjust the flavors to your liking. If it's too hot, add more honey. If the buffalo sauce is too sweet for you, add more cayenne pepper sauce. 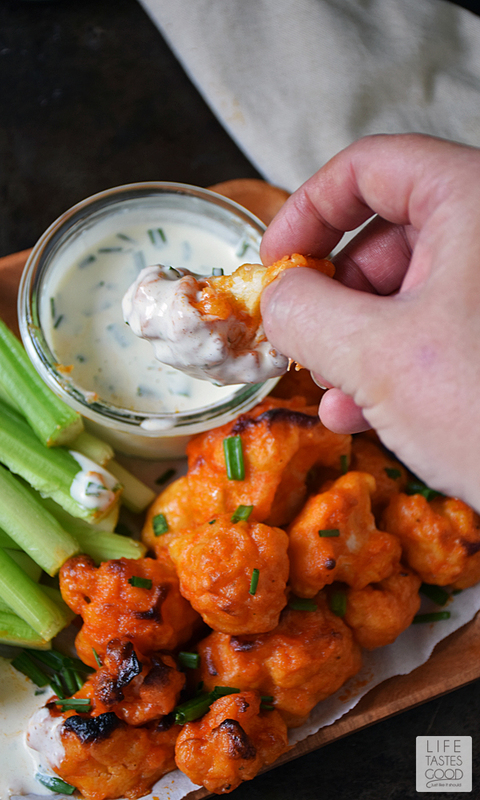 When the cauliflower bites are ready, remove them from the oven and toss with the buffalo sauce mixture. Spray the rack with cooking spray again and place the buffalo cauliflower bites back on the rack. Put back in the oven for 10 more minutes until browned to your liking. 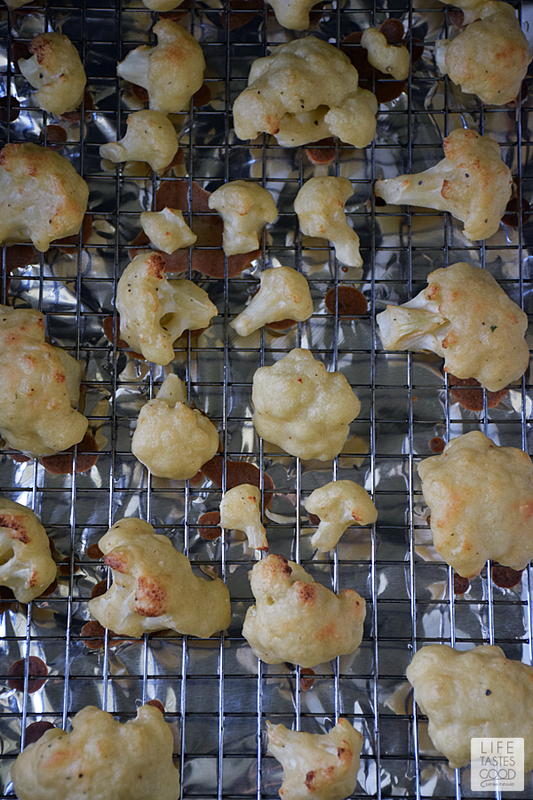 Remove the buffalo cauliflower bites from oven and allow to cool slightly. 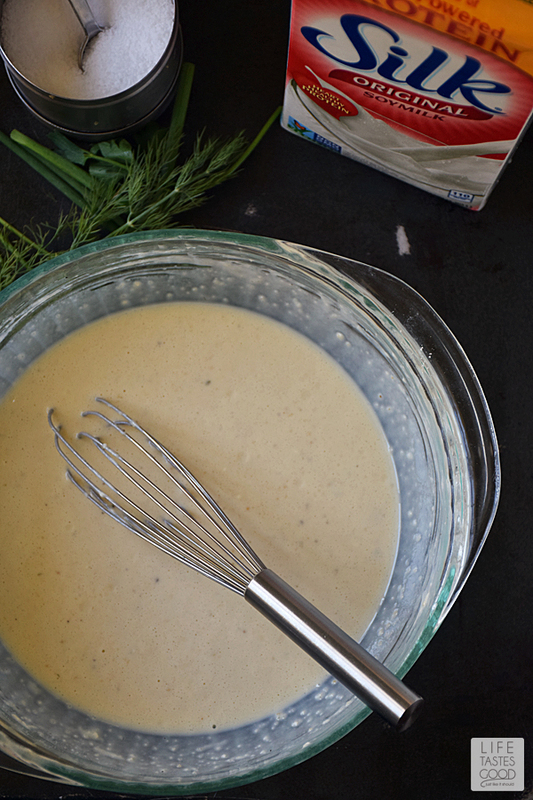 Transfer to a serving dish with the Dairy-Free Ranch Dipping sauce and enjoy! 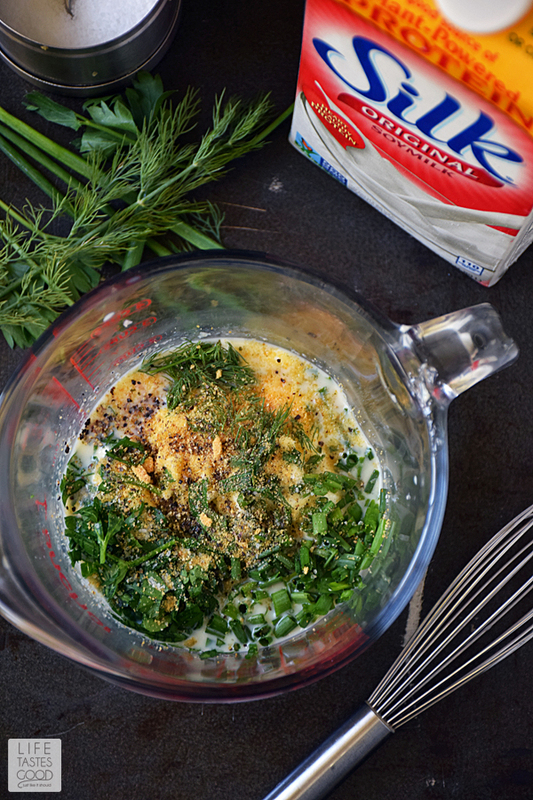 In a mixing bowl, combine 1/2 cup Silk Soymilk, 1 cup mayonnaise, 1/2 tablespoon fresh dill, 2 tablespoons chopped, fresh parsley, 2 tablespoons chopped, fresh chives, 1/2 teaspoon garlic powder, 1/4 teaspoon onion powder, 1/2 teaspoon kosher salt, and 1/4 teaspoon freshly cracked black pepper. Whisk to combine. Give it a taste and adjust the seasonings to your liking. Cover and refrigerate until ready to use. Preheat oven to 450°F and line a baking sheet with foil. Place an oven-safe rack on top of the foil and spray generously with cooking spray. 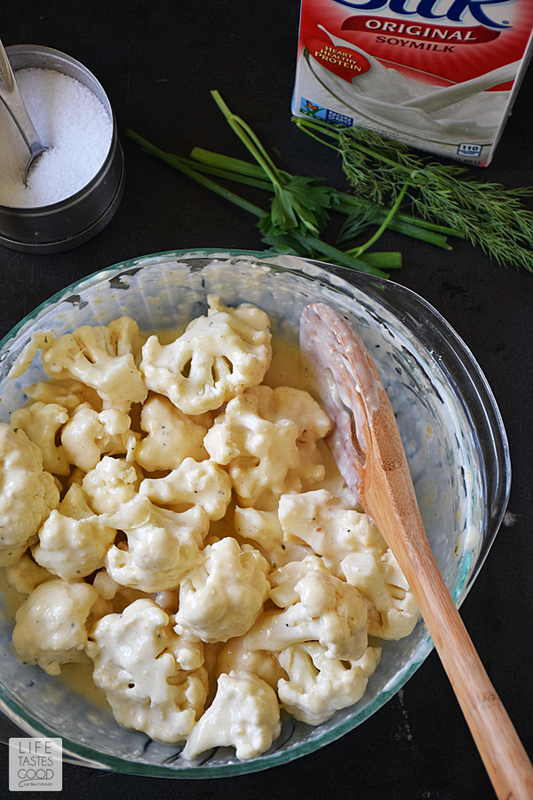 Prepare the batter for the cauliflower by combining 3/4 cup all-purpose flour, 1 cup Silk Soymilk, 1 teaspoon garlic powder, 1/2 teaspoon kosher salt, & 1/4 teaspoon freshly cracked black pepper. Whisk until smooth and thickened. Gently toss the cauliflower with the batter, being sure to coat the cauliflower thoroughly. 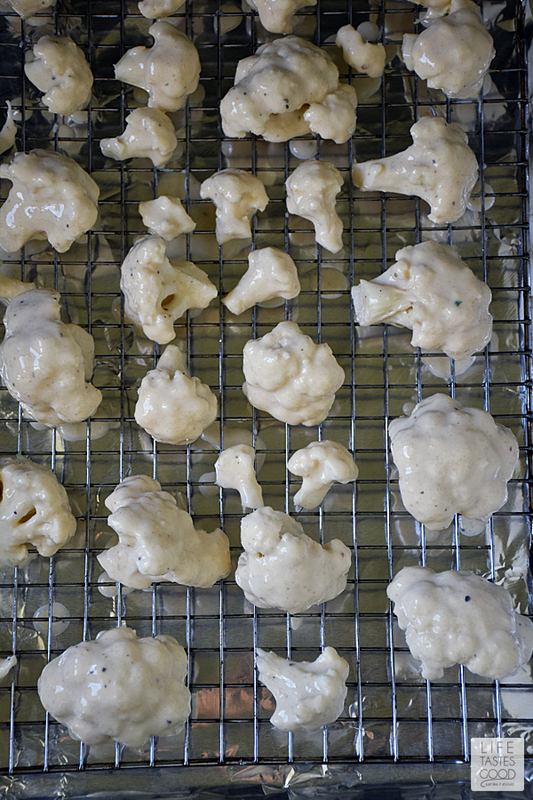 Place the coated cauliflower onto the prepared rack, being sure to leave space between each one. Bake in the preheated oven for 20 minutes or until the cauliflower starts to brown. While the cauliflower is baking, melt 3 tablespoons dairy-free butter and mix with 1 (5 ounce) bottle of cayenne pepper sauce and 1 tablespoon honey. Whisk to combine. Give it a taste and adjust the flavors to your liking. When the cauliflower is ready, remove it from the oven and toss with the hot sauce mixture. Spray the rack with cooking spray again and place the cauliflower back on the rack. Put back in the oven for 10 more minutes until browned to your liking. Remove from oven and allow to cool slightly. 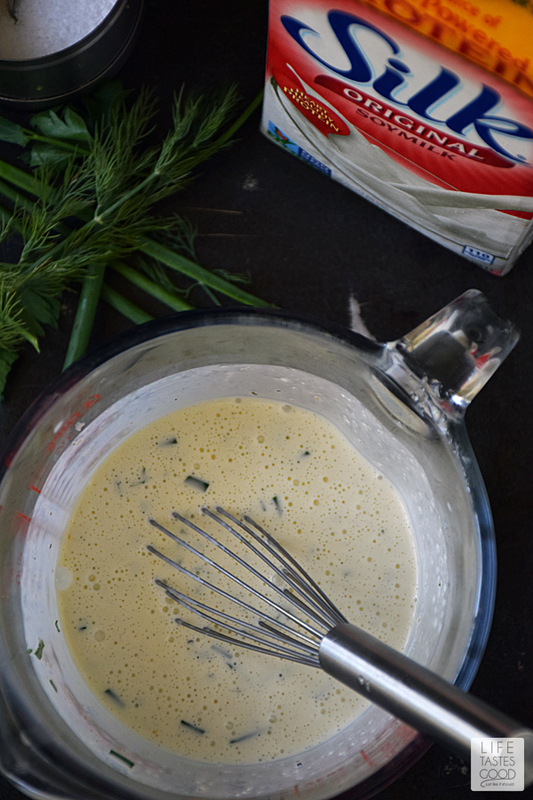 Transfer to a serving dish with the Dairy-Free Ranch Dip and enjoy! I love using cauliflower instead of chicken. It makes an amazing appetizer. Yours look so crispy and delicious especially with the dipping sauce. I can't wait to try these! Such a fun change up from chicken! You make these look so tempting! I'm seriously going to have to give these a try sometime! I know Joe would be skeptical, but if Don liked them so will Joe! Excellent use of the Silk Marion! So creative! I especially love that you batter-baked the cauliflower. I've never seek that, but I can imagineit gave the florets some texture before buffalo saucing them up. I love this recipe. Too cute about Don and so smart with your response...however I bet if you make tofu he will love it too. lol I have to try this out, looks yummy! Could you use almond milk instead of soy? Is there something that can replace the soy milk? I'm sensitive to it because of thyroid issues. They look so yummy! Absolutely! You can use regular milk. Thanks for stopping by! Enjoy! If you want to keep it dairy free, I used unsweetened almond milk. Both the batter and dip come out delicious. I use unsweetened original almond milk (Blue Diamond brand), but you can also use cashew milk, coconut milk, rice milk, oat milk, etc. Last night I made buffalo cauliflower bites using part of your recipe (I used ranch dressing I had on hand, Franks Wing Sauce, and dairy milk rather than the Silk soy milk) so basically I used the batter and baking methods for the buffalo cauliflower. They turned out fantastic! I like that they weren't soggy and of course, the incredible flavor! We didn't finish all of them last night so I reheat the remaining in the oven for lunch today. They were still just as good reheated. :) When I have more time, I'd like to give your ranch dressing and homemade sauce a try as well. Thank you for the great recipe! Trying to understand why you used mayo if you are posting about dairy free and meat free. Sub out mayo with Just Mayo this would make the recipe complete animal free. I was wondering if you could sub the AP flour for cassava flour to make it paleo? 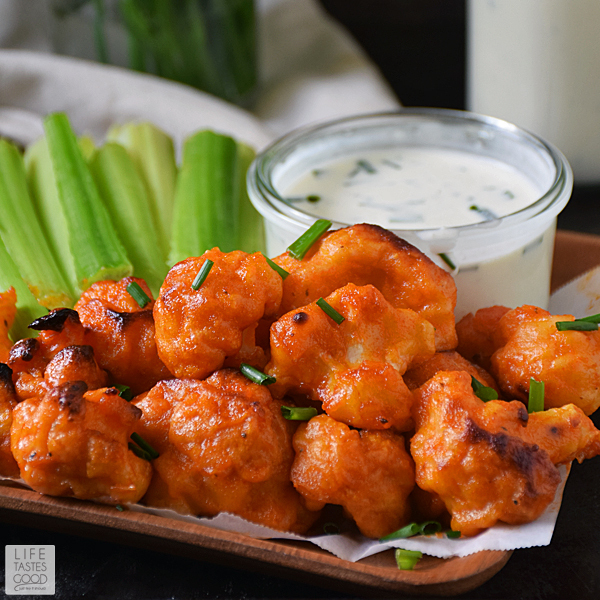 I've been searching for a good buffalo cauliflower recipe and this one looks delicious! I'm wondering if it's possible to sub the AP flour for cassava flour to make it grain/gluten free? I have not tried that and having not worked with cassava flour it is hard for me to give you a good answer. The flour acts as a coating in this recipe to help hold the hot sauce better and also to crisp them up a little better. I don't know how cassava flour would perform. I'm sorry I'm not much help, but please let me know how it works if you give it a try. Thanks so much! I have made a similar recipe using cassava flour and it works well. Since it is such a starchy flour, cut the liquid in half and add more as needed to make it a batter. It will thin out quickly. I've also used garbanzo bean flour, which works really well too, though not paleo, it would be grain free, and also adds a nice bit of protein. A combination of garbanzo and cassava works well too! Does it have to be fresh cauliflower? I had frozen a bunch a while back and was wondering if I could use that. Thanks! Melissa, I haven't made this recipe with frozen cauliflower, but I don't see a reason why it wouldn't work. Enjoy! If using frozen cauliflower, would it need to be thawed any first? Mary, I haven't tried it, but I would thaw it first before using in this recipe. Enjoy! Ok, thanks! Looking forward to trying your recipe. Why did all my batter drip to the bottom tray? Seemed like you can't substitute regular milk because it isn't thick enough. Next time I will use a lot less milk! I made this recipe tonight and it was delicious. I used Frank's red hot sauce which I chose to dilute a bit more with another tablespoon of vegan butter. Also, I added 5 minutes to the initial baking time and 5 minutes more to the bake time after having added the buffalo sauce. And may I just say that this non dairy ranch dressing is that absolute BEST. It was amazing I was so impressed with myself after making it Lol Word of Advice; invest in one of those sheet racks the author uses in her pictures. It makes a world of difference when it comes time to take your freshly battered cauliflower from the baking sheet. Anyways, This recipe is definitely going into my arsenal. Thank you so much! Hi! New blogger and a new-ish vegan here! I tried your recipe a couple of months ago and fell in love with these cauliflower bites! I've made them countless times, since then. I'm hoping I can link your recipe to my post and use your picture in the post itself? Please let me know if this is ok? So glad you love it! My hubs bugs me all the time to make these. He can't enough! Totally fine to link to the recipe & use a photo. Thanks for asking and happy blogging! It's not "meat-free" if you use mayo. It's important to let everyone know this, as eggs are meat. It comes from an animal, and is an animal not born yet. Carolyn, I agree eggs are a meat by-product, but they are not meat. This recipe is not vegan, but it is meatless. Do you know if I can use the Harts Vegan Mayo and get the same results? I have not tried that, so I'm not sure how that would turn out. Would love to hear your results if you try it! I made these with using almond milk. The sauce was WAY TOO HOT. So sad bc it was time consuming and I was pretty excited that they would taste good. The texture is nice. Next time, I'll make homemade BBQ sauce. Honey isn't Vegan. Vegans will not be using honey. They could use raw agave nectar, however. Thanks for the recipe, Marion! 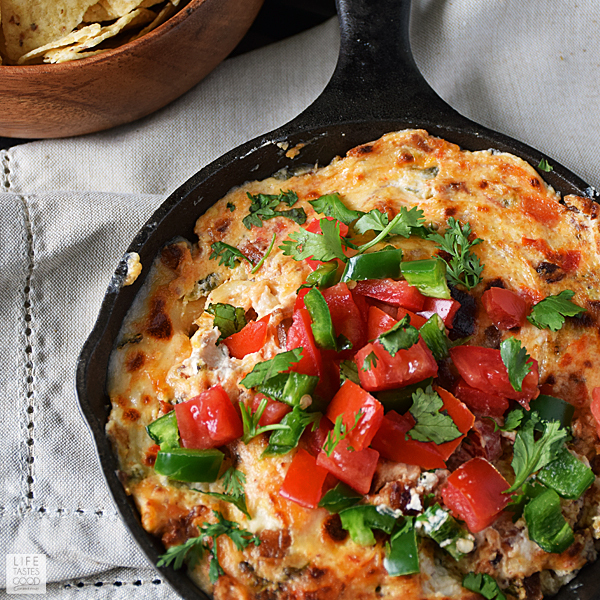 These came out super delicious and were just as tasty after reheating the leftovers! Definitely will make these again! I was wondering around how many calories the buffalo bites are? Hi! Do you have the nutritional information for this recipe?